After you've created add-ons for your online ordering site, you'll need to assign them to menu items to be visible to your customers. 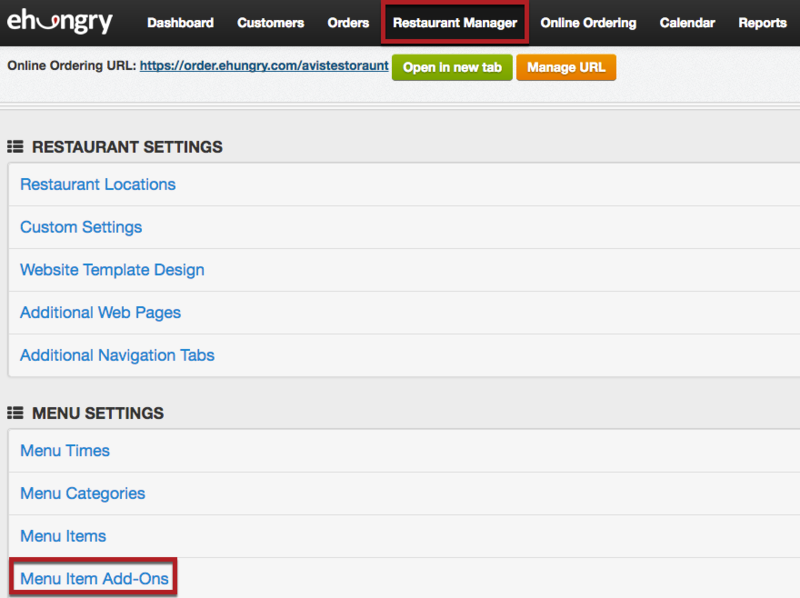 In your Online Ordering Console, you can assign add-ons by selecting "Restaurant Manager" from the main menu, and then selecting "Menu Item Add-Ons" under the "MENU SETTINGS" heading. Then click the "Assign Add-Ons to Menu Items" button. On the Assign Add-Ons page, you'll see the menu items that you have created so far in a list on the left of the screen, subdivided by category. To assign add-ons to any menu item, simply find the desired menu item in the list, then click on the link labeled "Assign or remove add-ons." In the pop-up window that appears, select the checkbox next to each add-on that you want to assign to that menu item. In some situations, you'll want to provide a customer with more than one option add-on. For example, let's say that you have a Prime Rib Dinner on your menu, and that dinner comes with a choice of three sides. 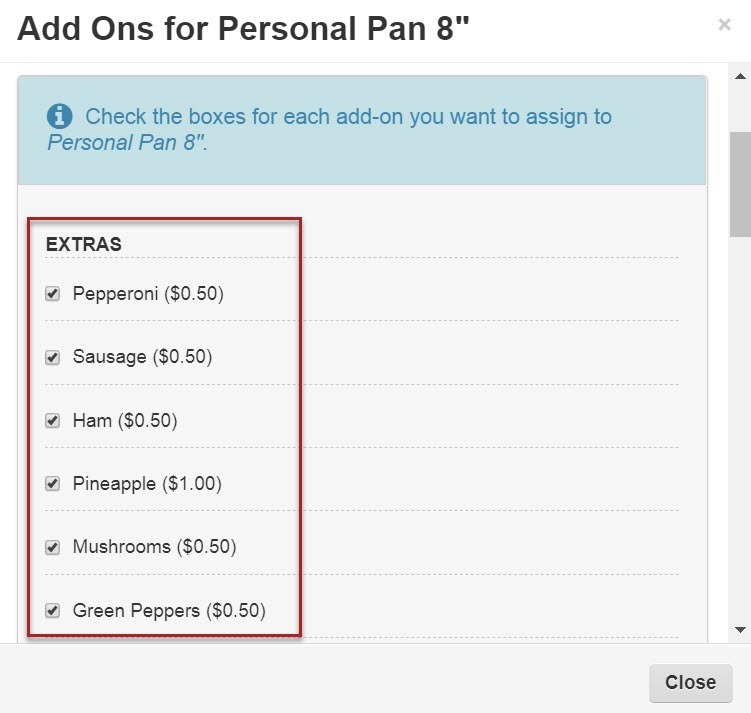 You'll need 3 identical option add-ons, from which the customer can choose 3 different sides. Our system won't allow you to assign the same option add-on to the same menu item more than once, so to accomplish offering 3 option add-ons to the same menu item, you'd use the multiplicity feature. Multiplicity simply means "how many times do I want to display this option add-on for this menu item?". 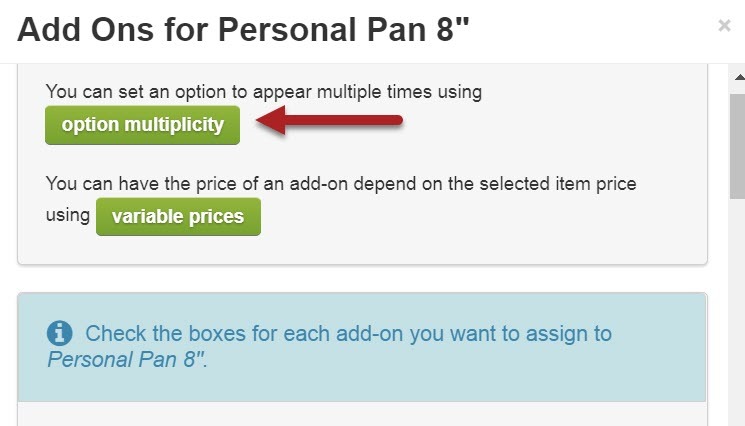 On the next screen, you would set the "Multiplicity Factor" for the "Side Choice" option add-on to "3". This tells the system to show the drop-down box three times and to require the customer to make all three choices, even though the actual list of choices is the same in all three cases. By default, all add-ons either have a single price, or no price at all. 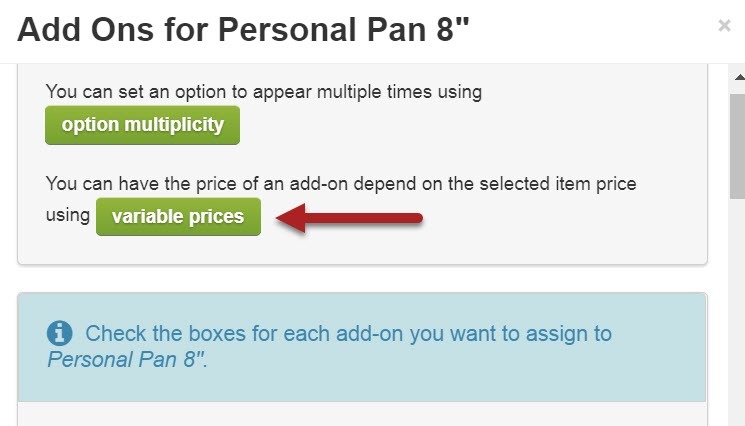 A particular extra add-on might have different prices, depending on which menu item it's associated with. For example, extra cheese could have one price when it's added to a small pizza, and a different price when added to a large pizza. By selecting the "variable prices" button, you can assign different prices for the add-on on the next screen. Extra add-on Groups are just containers for your extra add-ons. They don't really "do" anything. They simply allow you to specify that "these five extra add-ons should be displayed under this label". The labels are the names of the extra add-on groups. Extra add-on groups are used entirely for aesthetic reasons to make a very long list of extras appear more manageable to your customers. In an upcoming update, we will be extending this functionality to option add-ons and topping add-ons as well.